Whether treating rail cars or bulk material moving on conveyors, calcium chloride has proven invaluable when cold temperatures combine with moisture to freeze processing materials. A properly designed system customized for your unique needs combined with the proper strength of calcium chloride and most efficient application rate can virtually eliminate freeze-ups due to mother nature. Included in Pollard systems are various storage alternatives, and pumping, spraying and control equipment. Each system must be designed and evaluated in respect of your specific requirements. The movement of bulk materials such as coal, crushed stone, gravel and sand from rail cars and conveyors is made much more difficult when they are frozen. Calcium chloride, in actual use, has proven effective as a freeze-resisting and thawing agent. Studies have been made to determine the corrosive effect of calcium chloride on the cars. 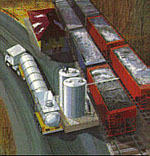 Twenty rail cars were assigned in dedicated service to supply coal from Western Pennsylvania to a production facility. Thickness readings were taken on 12 points of each car's slope sheets prior to beginning the tests. From October 1979 to April 1980, approximately 1.2 imperial gallons of 32% calcium chloride solution per ton of coal was sprayed into the car, half on the walls and bottom prior to loading and the remainder during loading. A second set of thickness readings was taken in April and no further applications of calcium chloride were made until October 1980 when a third set of reading was obtained. As is readily apparent from these data, corrosion/erosion rates were actually higher without treatment than with treatment. There are two reasons which may have accounted for this: greater moisture in summer cold and warm temperatures, which are factors known to increase corrosion. Nonetheless, the conclusion is clear: calcium chloride used according to the test conditions does not markedly contribute to hopper car corrosion rates. 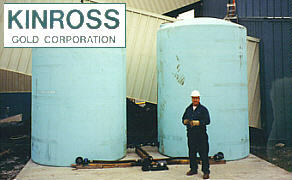 There may be applications, however, that are sensitive to corrosion. Pollard has responded to these situations with it's Corrosion-Reduced Calcium chloride product line.